NB: This "bio" was posted at a time when Brother Joseph was in vows as a "hermit" per Canon 603. As of March 21, 2019, Brother Joseph's vows "expired" and were not renewed. This means that officially, Brother Joseph is not currently a canonical member of the Consecrated Life...which means he cannot officially be called "Brother". For now, however, this designation will remain in certain places on this website and in this biography. Brother Joseph Murphy is a native of San Mateo County and has spent his whole life in the San Francisco Bay Area. He was raised in San Carlos and attended Saint Charles School, San Carlos High School, and graduated with a Bachelor's degree in English from College of Notre Dame (now Notre Dame de Namur University). The Second Vatican Council's call to return to the earliest roots of Catholic Christianity influenced his choice of religious life and inspired the manner in which that way of life would be lived. Joseph found a kindred spirit in the fifteen hundred year old Benedictine tradition and desired that to live it in its purest form while remaining "at home" somewhere within the beautiful rural areas that still remain intact on the Peninsula. Joseph entered the Benedictine community of Woodside Priory which had been founded in 1957 by Hungarian monks in Portola Valley. After living for a full school year at the Priory, Joseph was sent to its "adopted" mother house, Saint Anselm Abbey, in New Hampshire. He was received as a novice on June 30, 1978 and took the name Brother Gregory. Exactly one year later, on June 30, 1979, Brother Gregory made his first profession of monastic vows and returned to Woodside Priory in California. After some theology courses at Saint Patrick's Seminary in Menlo Park, Brother Gregory went on to earn two Masters' Degrees: an MA in English from San Jose State University, and an MS in Library and Information Science from Simmons' College in Boston. For the next several years, Brother Gregory served the community as organist, cantor, guestmaster, school and monastery librarian. Father (now Bishop of Monterey) Richard Garcia was Brother Gregory's spiritual director for the latter part of the 1980s. It became clear to Brother Gregory that the challenges he was experiencing in trying to fit in with the Priory's lifestyle that centered on its College Peparatory School was pointing him in a different direction. With Fr. Garcia's support, Brother Gregory requested "exclaustration" from monastic life and departed from the Priory on Pentecost Sunday, June 4, 1990. In his spiritual direction sessions with Fr. Garcia, Joseph admitted that all along he had envisioned founding a more "primitive" observance Benedictine house within his native Archdiocese. Fr. Garcia never discouraged him in that hope, but Joseph would not be able to pursue this while still in vows to the Saint Anselm/Woodside Priory community. In 1992, Joseph visited Saint Mary's Monastery in Petersham, Massachusetts where he met the Superior, Father (now Abbot of Pluscarden Abbey in Scotland) Anselm, and spoke with him of his desire to found a new community similar to Saint Mary's in California. Fr. Anselm offered his spiritual and moral support, and permitted Joseph to become a "long distance oblate" to St. Mary's once his vows were dispensed in 1994. At this time, there appeared to be no avenues on which Joseph could continue pursuing his vocation, he put it aside for the next 12 years. In the years after leaving Woodside Priory, Joseph worked for the Marin County Free Library in Administration, sang with Saint Mary's Cathedral Choir and Schola, continued classical solo voice training, and appeared in a couple of local community theater musicals. In early 2001, Joseph left his job in Marin County hoping to start his own dressmaking business, but the poor economic situation that ensued left Joseph with no alternative, than to seek employment with another "day job" which came in the form of clerical employment at the Archdiocesan Pastoral Center in June of 2003. Soon thereafter, he was offered a job as a Cantor and liturgy music coordinator at Saint James Church in San Francisco and in 2006, accepted the position of Music Coordinator and lead Cantor at the National Shrine of Saint Francis of Assisi, where he formed a solo-quartet "Schola" to sing the Latin Chants of the 1979 Graduale Romanum and other early Catholic church music. In June 2009, the Shrine closed for seismic retrofitting and all Shrine staff members --including Joseph and his Schola--were laid-off. Although the loss of his very successful music ministry was a great disappointment to him, it was also an opportunity for Joseph to revisit his original vocation in earnest. By now he had become a familiar face at the Archdiocesan Pastoral Center and the quality of his liturgical music endeavors was much appreciated by Archbishop Niederauer. Sister Rosina Conrotto, Director of the Office for the Consecrated Life, expressed whole-hearted support for Joseph's vision and assisted in arranging for Brother Joseph to pronounce monastic vows as a hermit under the Archbishop as defined by Canon 603 on September 3, 2011. Over the past several years, Brother Joseph has maintained contact with the Superiors of the North American Monasteries of the Benedictine Subiaco Cassinese Congregation, and participated in their meeting at Christ in the Desert Monastery in New Mexico in January of 2011. 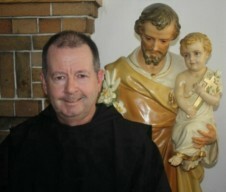 Brother Joseph retired from the Pastoral Center at the end of September 2013 to devote his time and energies entirely to his vocation and the establishment of the new Our Lady of Refuge Monastery. As of March 21, 2019, Brother Joseph's Canon 603 vows expired and were not renewed. It was deemed prudent that the vows not be renewed until a suitable living situation and reliable financial support be in place before the vows be renewed and even made permanent. The over-all plan on this website still remains intact.